Click here to your print your Wine Tasting INVITATION. Click here to print the Kiwanis REGISTRATION form. 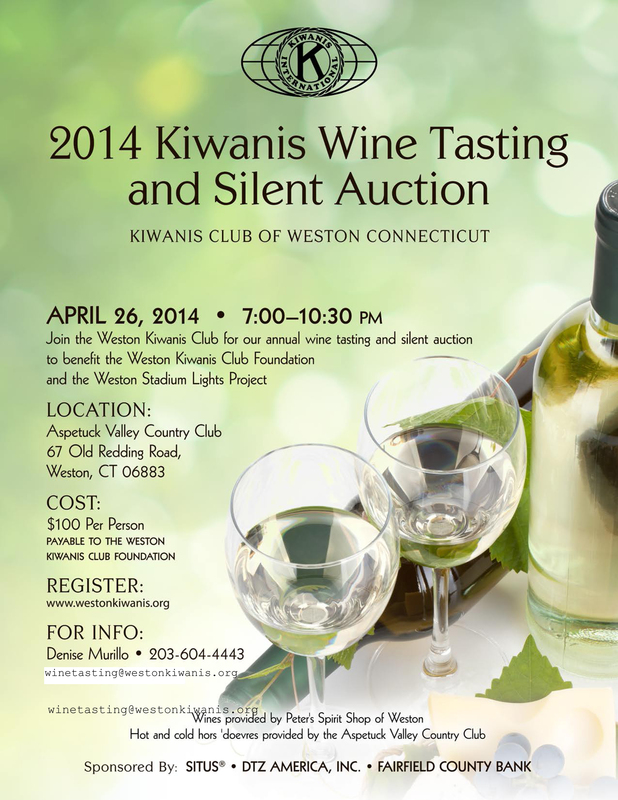 Weston is honored and fortunate to have Weston Kiwanis partner with the Lights Committee on this fundraiser to support the Lights Project. The ambiance of Aspetuck Country Club, will be the setting for a wonderful evening with old and new friends alike. For the less serious wine "enthusiast"-- the food, the wine and the good company will simply mean a great night out on the town without the kids all the while knowing that proceeds go to a great community cause. Register today. Invite your friends for a fun night out. * Kiwanis Club of Weston Since 1974 the Kiwanis Club of Weston has supported worthy causes in our community and surrounding areas through a combination of community service, philanthropy and assistance to youth and to people of all ages. Our members are men and women with a connection to Weston. The Club meets for breakfast Saturday mornings at 8:30am (except July and August) at the Norfield Congregational Church Parish Hall and often features presentations for local, state, and national political figures, and programs of general interest. Other meetings are followed by community service projects. "We are dedicated to changing the world, one child and one community at a time"
The Kiwanis Club of Weston Foundation has an active grant program which has provided almost $500,000 in grant funding since the year 2000. The Foundation prefers to donate money for the purpose of starting a new activity, purchasing capital equipment, or other specific one-time needs. The primary mission is to support children in our local community and region. The grant proposals are reviewed by the Kiwanis Philanthropy Committee who makes recommendations to the Kiwanis Club of Weston Foundation Trustees. Grants of $5,000 and above are presented to the entire Kiwanis Club of Weston Foundation for approval.